Economic Opportunity: Create opportunities for economic growth and security for all Oaklanders. Housing: Ensure sufficient housing is built and retained to meet the varied needs of current and future residents. Culture Keeping: Allow diverse voices and forms of expression to flourish. Community Health: Provide vibrant public spaces and a healthy environment that improve the quality of life downtown today and for generations to come. 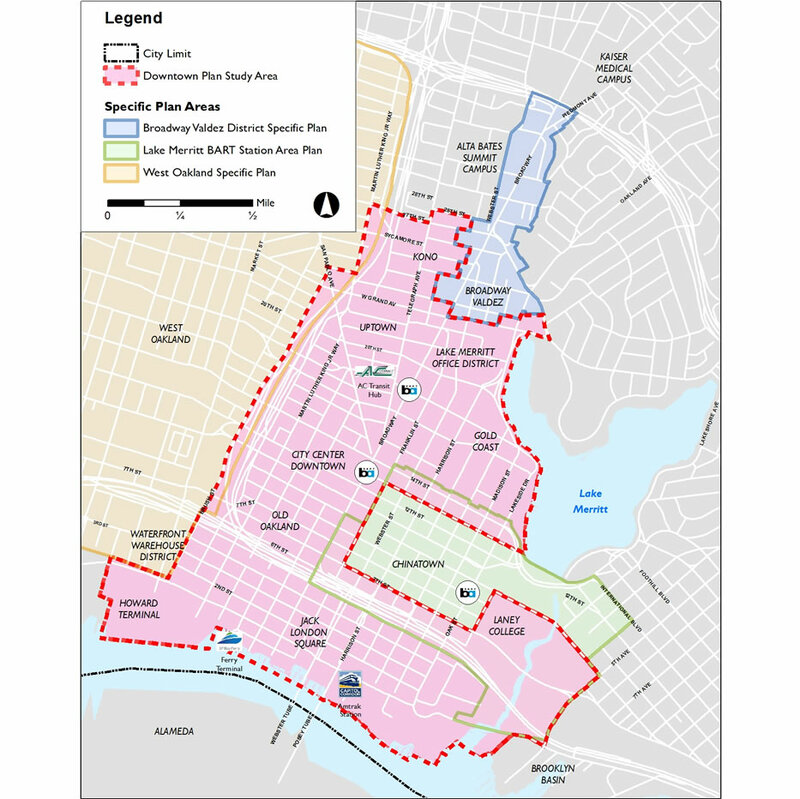 Land Use: Develop downtown in a way that meets community needs and preserves Oakland’s unique character. 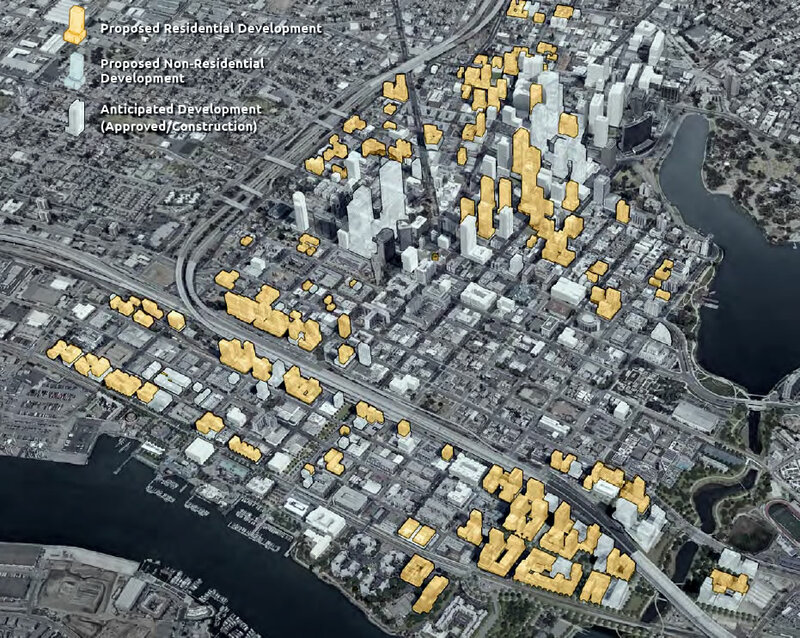 If adopted, the DOSP would allow for the development of over 17 million square feet of new commercial space and over 29,000 new residential units, including up to 7,250 units of housing which could be offered at below market (affordable) rates, centered around BART and its connectors. 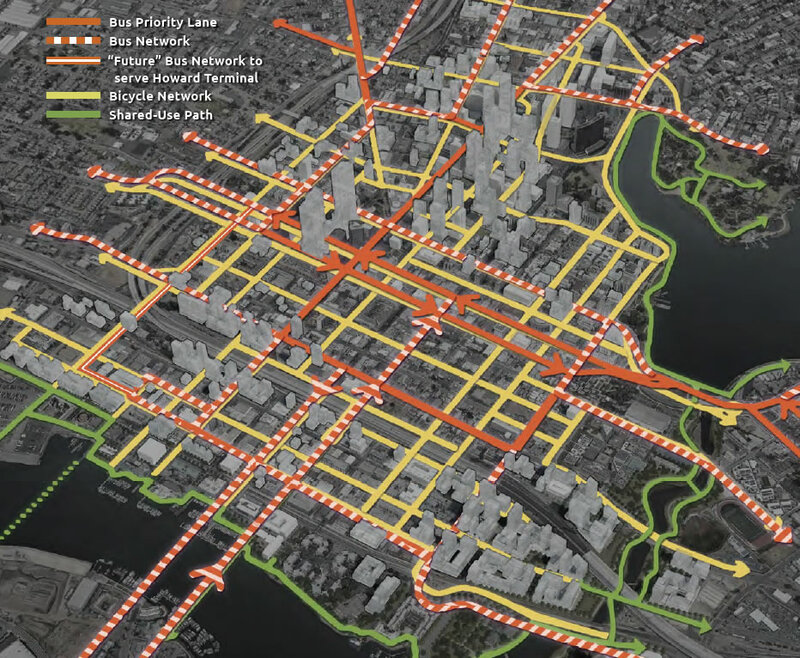 A network of multimodal streets would provide priority paths for buses and bikes, along with a continuous “Green Loop” around the downtown core, connecting to network of parks and open spaces. 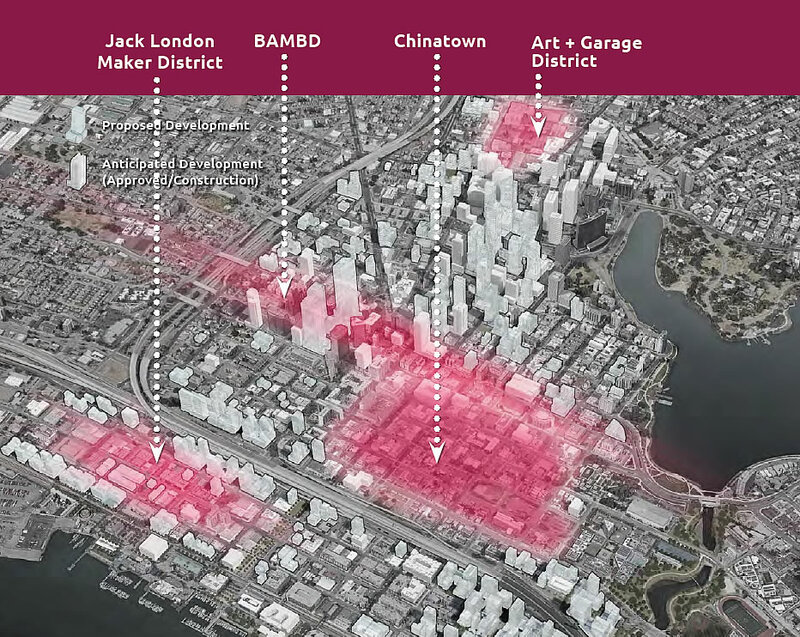 The adoption of special zoning and land use regulations would attempt to preserve four specific cultural districts, including the Black Arts Movement District (BAMBD) and a Maker District around Jack London Square. 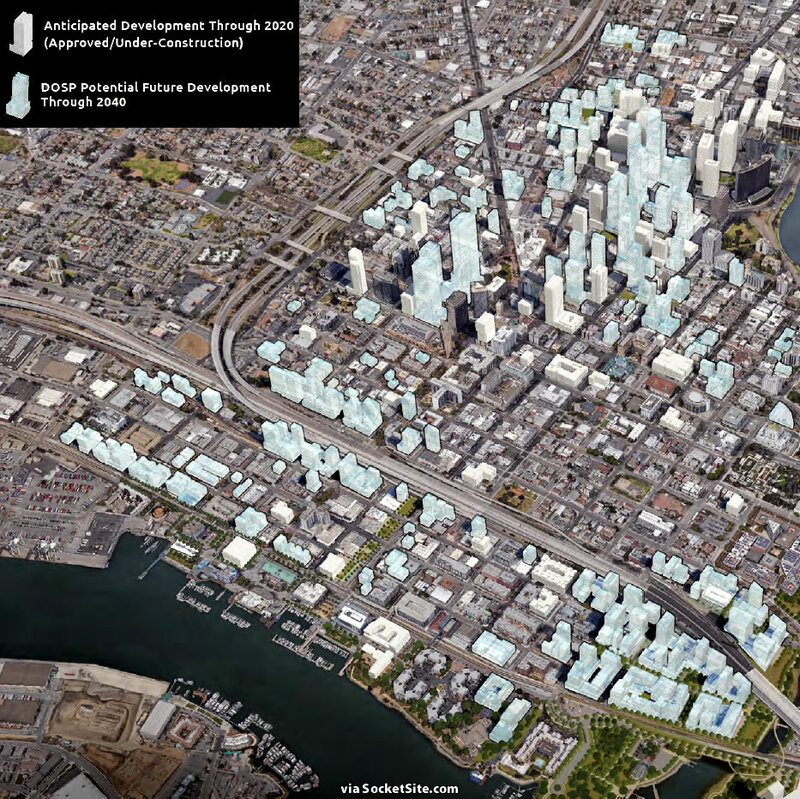 And in terms of timing, Oakland’s Planning Department is aiming to publish an official (non-preliminary) draft plan this summer and targeting 2020 for the plan’s adoption. We’ll keep you posted and plugged-in. Nice ideas, but given how the Bay Area is with regards to development, these plans will come to fruition long after I , if ever. And I am barely even 30 years old. I wonder who proposed some of these “proposed office buildings”; City Center, in particular, shows a number of Freud-friendly towers – ironically mimicking the original 1960’s concept – of which I have never heard. And note no A’s stadium is shown: that’s probably due to the timing of when this was prepared, but I expect much will be made of the absence. This is amazing. Now we know why the A’s want to be at Howard Terminal. This is going to be a huge and dynamic downtown. What were the Warriors thinking? Clearly Oakland is the future of urban growth in Northern California. They want to be there b/c they couldn’t get their first choice; speaking of which: I notice the montage shows the Laney parking lot covered in housing (well, monochromatic prisms I assume is housing)… I wonder how the activists who decried the A’s evil plot to “destroy” the campus will feel about that. They were probably behind it. Laney would have been a very nice location for a ballpark. Even closer to BART than Howard Terminal. Having said that, Howard Terminal is a much more dynamic site right on the water and next to all the development on the waterfront and downtown. Actually close, as opposed to merely being in the same time zone. The ballpark will be situated next to the Clay Street Ferry Terminal so it’s actually only about .75 miles from 12th Street BART. By comparison Chase Center, the future home of the Warriors in SF, is 1.7 miles from the closest BART station, with is Montgomery. This is an incredibly dishonest, and very misleading characterization. You completely and intentionally ignored that Chase Center has the T Third Muni Metro line directly in front of it. The station for the arena is undergoing expansion right now and turnbacks are being built to further increase ingress/egress capacity from the arena site for the system. Also with the new platform in place, four two-car trains can load simultaneously, and depart inbound from both sides. These trains will be able to continue straight down 4th Street into the central subway (probably in the middle of the next NBA season), connecting directly to BART at Powell Street. The walk from the Caltrain station at 4th & King to the front doors of the arena is ~4200 ft (0.8 miles) which is effectively identical to the walk from 12th Street BART station to the nearest edge of the Howard Terminal ballpark site. But Caltrain passenger can also, if they so choose, jump on the T Third Muni Metro directly outside the Caltrain station and take that the 0.8 miles to the arena. Beyond this, there are also plans in motion for a dedicated 2-ferry pier at the end of 16th Street directly across from the bay entrances of Chase Center. So to get there on mostly on BART, all you’d have to do is transfer at Powell, which is only just barely more cumbersome than having to transfer between BART lines depending on your origin and destination. So the notion that the Howard Terminal site is more dynamic than the Chase site (which is an apples-to-oranges comparison to begin with) in terms of transit options just doesn’t hold up. These are just the facts. You can *feel* however you want about each site, surrounding area, city, etc. And in any case, they’ll never have trouble filling the arena either way. Yes, most certainly, the Warriors should have built in Downtown Oakland next to BART. Fortunately, the Howard Terminal A’s ballpark will never be built. There are buses in Oakland that go from 12th St BART to Jack London Square. Transferring to muni is no different than taking an AC Transit bus to a ballpark at Howard Terminal. It’s going to be a hassle for anyone who tries to take BART to a Warriors game in SF. Settle down. It’s a preliminary plan that will only ever partially and differently play out over the course of several economic cycles. That is the case with all such plans. I lament the likelihood that this plan is coming on the tail end of an economic cycle, which will delay or outright cancel some (though certainly not all) early aspects of this plan. Oakland’s past, and to some extent current, leadership did not position Oakland well early enough in the cycle to reap the maximum benefit in developmental terms. The consolation may be that by the time this report is all official, it will be ready to go during the next upswing in a future cycle. Anonymous, no. A number of area specific plans were completed SEVEN years ago. 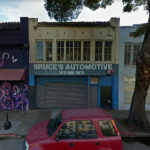 There’s been plenty of sentiment in Bay Area publications that SF-based CRE interests, who happened to own a major portion of Downtown Oakland CRE, failed to show any leadership and failed to generate interest in Downtown Oakland projects. It was only when out of state developers saw how ridiculous the opportunities were that the story changed. By mid-2020 downtown Oakland will have a population density somewhere between the Castro and Inner Mission, 90% of new residents which will make middle to upper income wages. We’re not in a typical cycle situation – we’re at a watershed moment when an area can defy gravity. Yeah, SF developers land banked land in Oakland keeping new inventory off the market while charging high rents for their SF properties. Kept Oakland down for the benefit of their SF properties. Thank goodness for out of area developers who saw the tremendous value in Oakland and had nothing to protect in SF. There’s no verifiable basis for that claim. The only thing that can said of it is that we’ll have to wait and see. Anonymous, as optimistic as E.G. can be, you’re his polar opposite. I don’t know if I should even bother with you as I’m pretty sure you’re prejudice beyond hope or just toying with me. John Dolby of Cushman & Wakefield… ever heard of him? C&W manages or owns more Downtown Oakland CRE than I can fathom at 1040pm. 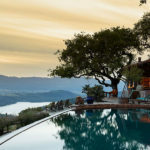 Recently in SFBT he was quoted with essentially what I wrote, that SF brokerages did not even suggest that their clients view Oakland properties, “Years past, that would not have been something they would have brought up.” Regarding my “wait and see”. First, downtown commercial and residential property presently has some of the lowest vacancy rates in the nation. Second, with ~15,000 residents already downtown combined with new residents moving into units that *have* broken ground (6,000 units) -if only 1 person moves into each unit we’re at the Castro’s density (21k/sqmi) and if the average size household takes each unit (2.5 humans) we’re at the density of the Mission (30k/sqmi). It’s as “wait and see” as wondering if come tomorrow we’ll still be orbiting the sun. Quite enjoy your baseless and frankly pointless little attack on me there. I have not stated anything that goes against available evidence and have in no way rendered a negative opinion about the worthiness or benefit of more development in Oakland. But by all means, continue with the willful misinterpretation and attribution of conspiracy as the main factor in slower than desired progress in development. And by the way, if you haven’t been following along, there are numerous major projects underway to densify the Mission. The pushback to some degree on that is expected, and is only sometimes effective and certainly hasn’t prevented several large projects from moving forward. You can’t view the Mission as a static area without increasing density as well. Last comment on the subject I’ll make is that if you reread what I actually said is that the plan will never fully be built out as outlined. That’s a totally uncontroversial stance that would be crazy to bet against. This is true of all such plans regardless of city. Unforeseen factors inevitably cause delays, changes, and cancellations of projects. Of course development will continue over the long arc. It just that’s it’s almost certain to not be as fast or extensive as laid out. Lol!! Please!! Oakland has a long ways to catch up to SF. And because of that, every city in NorCal will never compare to it. It’s the real urban center of NorCal. Everybody knows that. They should be looking at a new tunnel from Linden St. (Oakland) to Main/Mitchel St.(Alameda). The existing Posey tube and the Webster Street tubes are very bicycle pedestrian unfriendly. Ridiculously bad. Plus Posey is from 1928. It is almost 90 years old! They can’t rebuild it in place – they need to look at a 3rd tube starting now so that it can be open by the time Posey closes. Sigh. These aren’t planning offices – they are just the municipal arms of real estate developers. The tubes – Posey has a sidewalk, albeit narrow, Webster has none – are part of a state highway (SR61) so I’m not sure they’re under the jurisdiction of the county. As for the idea that $100M’s should be spent to make a more “bicycle pedestrian friendly” route, I think those kinds of funding priorities go a long way toward explaining why more doesn’t actually get built. Wasn’t quite the point I was making. Posey also carries 2 lanes of vehicle traffic. It’s going to need to be replaced sooner rather than later. It’s not going to last forever, it’s already 90 years old. The City should start planning for that now. The location of the replacement is a local land use decision that should be included in any downtown plan. When, not if, it gets replaced, it would be nice to have a proper bike/ pedestrian path. Which might be what $5 mil out if the total $100 mil project? I seriously doubt the citizens the tunnel serves care what branch of the government owns it, they just want the road to function better than the horse and buggy era. Lets just move 880 over to Alameda. Seriously. Oakland is moving away from automobile-centric planning while Alameda can’t seem to imagine a world without them. They’re planning 90’s style 2-car tract home developments as we speak. So, Alameda you love cars so much -here’s the freeway, take it. I agree with you Matt! Actually just building the 2nd bart tube with an alameda connection will solve a bunch of the traffic issues in alameda. As much as I dislike freeways they’ll always have legitamite use, but in the dense core (central SF and DTO / alameda / Berkeley ) there is absolutely no reason to build any new accommodations for cars. And develop the parking lots. Just more subways, on street scooter/bike lines, etc. cars in the core are noisy dangerous and polluting and I’d never advocate elimatung completely ( unrealistic) I do think they should get reduced. The 880 freeway through downtown is a huge eyesore and splits downtown from the waterfront. They need to underground the downtown section of 880 and create a seamless connection between DTO and the waterfront at Jack London Square. 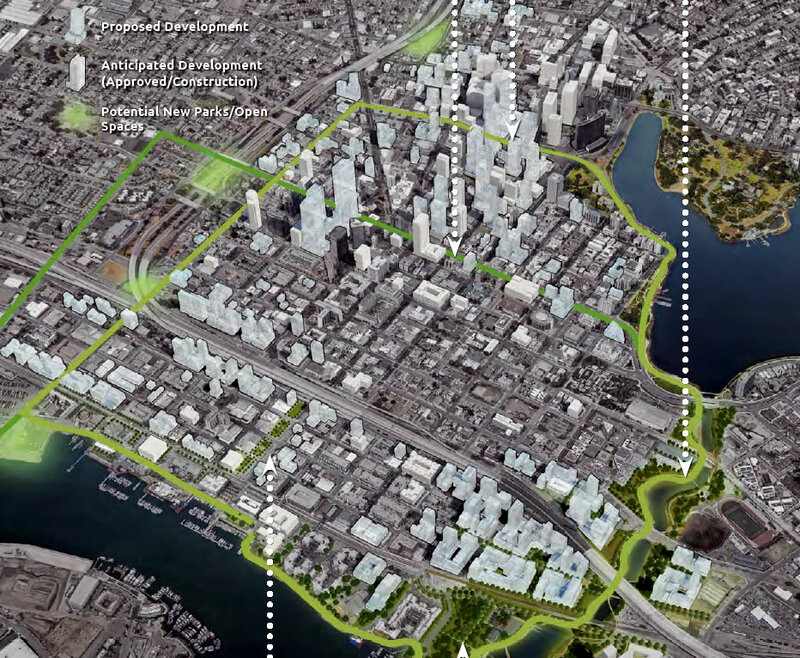 SF got rid of the Embarcadero freeway, Boston had the Big Dig, and now Seattle is tearing down their double decker freeway monstrosity on their waterfront. Oakland needs to do the same with 880. Those underpasses connecting downtown to JLS are unpleasant, dirty, forbidding connections to the waterfront. Oakland should at least clean up and make the underpasses a bit more presentable until something major can be done. Puh-lese: the ‘Big Dig’ was one of the most notorious examples of cost-overrun (and by implication mismanagement) known to man …sorry TJPA “the City” plays distant second to “The Hub” in this regard – and while Boston, as the big player in the Commonwealth, was afforded such attention, Oakland (Number Eight in the Golden State) is unlikely to receive it. Do think the city of Alameda would stand for “having 880 moved over onto it”? I somehow doubt that. Not to mention the $billions in construction costs. There are approximately 24,591 pending transportation projects that would make better use of those funds in the Bay Area. While I agree that the current configuration is an eyesore, it really doesn’t interfere much with traveling between downtown and JLS due to the fact that nearly every street between the two also passes under 880. 980 is a much more significant obstacle to accessing downtown via surface streets. I think Alameda would love a BART station. The whole reason it is car-centric is that historically regional transportation has bypassed it. When they build a second BART tube it should definitely have a Alameda stop. Moving or putting 880 underground is a waste of money. But putting BART underground – between Downtown and West O – that would make 8-10 block buildable with much higher density…. Wrong! Historically Alameda had some of the most thorough mass transit coverage in the Bay Area. You young’uns forget the vast reach of history. And a small note of trivia: Alameda had the terminus for the first Transcontinental train…tho Oakland soon usurped the honors. I would like to see a train tunnel from starting north of Oakland Coliseum station to just south of Emeryville station for use by Capitol Corridor and other services. Ideally with an underground station below BART 10th St station connecting both. This would give Oakland a proper downtown station for the business district. Also, commuter from far away can quicker connect to a BART train to SF here instead of the round-about way in Richmond. There are two problems with putting the tracks underground. (1) The Lake Merritt Channel is in the way, which would require sinking the tracks very deep, and (2) almost all of the traffic on those tracks is freight to and from the Port. Engines pulling heavy strings of freight cars can’t easily roll up and down the grades an underground stretch of track would require. And remember that the tracks would have to be back up on grade by the time they get to Brush Street so that they can load and unload containers at the container docks and in the Intermodal Yard. This plan is a non-starter. It demonstrates a tremendous lack of vision for the future. It’s a complete joke. For a start, I see no spaceship landing pads. My next vehicle is a Tesla Private Spaceship®. I’ve already paid my deposit. I see not one single area where I can park. My business partner commutes via electric hovercraft. I don’t see a single electric hovercraft charging pad. This so-called grand plan is not 21st century. It’s old fashioned, failing for the same reasons which have crumbled cities of millennia past. Downtown Oakland must build down, not up. Residents and workers would be far better served by a system of underground bunkers. Street level must be preserved for 24 hour block parties and full-throttle electric scooter racetracks. Global warming is a feature, not a bug. The next-generation workforce will consist of multilingual non-gender robots which can travel via land, air, sea or space, including other dimensions existing or non-existing within this and any other universe. Severance is expensive and CALPERS is broke. A forward-thinking plan will not require a single set of concrete boots. Oakland must develop for the future, not the past. If you share my concern, the first preliminary meeting will be held at at City Hall 6PM tonight. Thank you BB – I don’t think any city has such visions in their planning. Regarding the TPS just get the hover mode upgrade so you don’t need a parking spot and the EZX battery pack that only requires annual charging – it will be money well spend! Oh snap – hover mode wasn’t available when I put in my order. I logged in and added the upgrade. Thanks for the info. Went down to the meeting. There was only one copy of the plan on the table. It was the size of a phone book. They wouldn’t let you take it which makes sense if they don’t want you to read it. Some ladies were blah blahing and everyone looked kinda bored. One of the commissioners was eating dinner up on the big round table. I tried to get a closer look. I think it was Chinese or maybe Thai. That made me hungry, so I bailed, went home grilled a burger and turned on the basketball. I can multitask, too. 338 pp according to the link embedded in the story, which, since you were already logged in for hover upgrades you might have downloaded…perhaps your multitasking has its limits ?? I need hard copy for the guy that sells Street News on my corner. He’s one of the most politically connected dudes in the city. Looks can be deceiving. He doesn’t have a computer. The upside is he’s spared from the new City website, which is as useful and elegant as one of them scooters snapped in two and tossed in Lake Merritt. Yeah, my multitasking has its limits. It’s called priorities. Spurs/Philly went to the last second and my burger was way tastier and hotter that whatever that schmuck was scarfing. He didn’t even share with the rest of the class. You wanna hear more about my burger? Hmm, on further thought, I’d take the broken scooter.